Norton is powered by Symantec, a company founded back in 1982 and headquartered in Mountain View of California. In our review of Norton’s online backup service, we are going to learn more on what this company offers, in order to back up all of the files and other data from various devices. Since we are eager to come up with the most reliable solutions in this field, we cannot wait to display all the ups and downs of Norton’s product and inform you about them. The one thing that is sure is the fact that everyone should pay attention to such services and keep his data secure – not only locally (with the use of hard drives and other storage devices, but online as well). So, without any further to do, let’s get started with our review! Norton certainly bears a heavy name in the field of computing and Symantec is acknowledged universally for its products. This does not automatically qualify all the different products and services that this company offers, though. This is why we do not solely rely on the brand of a product, rather than combine it with our very own, personal experience. This is what we have done in this case, too! 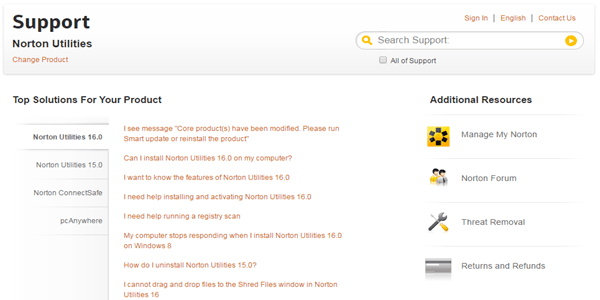 Now, we are ready to display the major features of Norton online backup service. So, here we go! First of all, Norton is crystal clear as to the space offered to its users and 25 GB is all you can get at a fixed price. This is expandable of course, but it will add significantly to your pricing. We think that there ought to be a more generous plan provided for online backup, as literally everything should be backed up. Especially if you add the fact that up to 5 devices can use the same storage space, you can see that the limitation is very heavy. Moving on, Norton offers “file versioning” and in fact keeps deleted files for up to 90 days for you to access. This is certainly beneficial, though there are cases when files are kept indefinitely. The encryption is one of the most important features in every option of online backup and this is where Norton pulls it off truly wonderfully. 128-bit SSL encryption is available for sending and 256-bit AES encryption for storage, referred to as “government grade” encryption. Automatic backup and file compression are two more features of premium value. Things are quite straightforward here for Norton, as a whole year of protection for up to 5 devices will cost you $49.99. One month is available at $4.99. There is a free trial offered to the potential customers for a whole month, as well as a full money refund guarantee lasting up to 60 days after the purchase of your subscription. In addition, when it comes to the payment methods accepted by Norton, you can use Visa and MasterCard, UCB and American Express, as much as Discover. The price is pretty affordable, with the exception of the expanded file storage space that adds significantly to the final bill of yours. Now that we have informed you about the Norton online backup cost, it is high time we moved forward to the help and support department. There are numerous different options for you to choose for having any inquiry of yours answered promptly and thoroughly. First and foremost, there is the support offered via FAQ sections and other details at the knowledge base of Norton. There is also a search bar for you to use and get to the answer that you are searching for, without having to search everywhere. Norton Forum is another solution, in case you wish to interact with other Norton users or express your question directly to those who know the answer first hand, due to their experience. Finally, there is the alternative for you to make use of the Ultimate Help Desk. The bad thing is that this service comes at an extra price, which stretches from $5.99 to $19.99 per month. Of course, there are special benefits to this option but the cost can be forbidding to most individuals. As far as compatibility is concerned, Norton online backup is suitable for Windows and Mac users. To be more specific, system requirements include Mac OS X 10.5, 10.6, 10.7, Windows XP and Vista, 7, 8 and 8 Pro. According to the OS that you are using, you get the proper guidelines that will help you out towards installing and using the service to the maximum. Norton Connect app is offered for free and helps you get all the data of yours while on the go on your Android or iOS running device. Norton online backup service is an affordable solution for all those people who do not wish to take up a lot of space online, since there is an initial limitation applied to 25 GB. The encryption used is high-tech and allows you to sleep tight, without any fear of getting your data lost or intercepted in any way. The automatic backup and the file versioning are great features (though the latter could be infinite for more convenience). The price per month or even per year is quite inexpensive, but the expanded data storage and the help desk can skyrocket the cost. Symantec has created a solid solution, even though there is not that extra something that would make it an exceptional solution in online backup. Although there is solid encryption involved in all the data stored by Norton online backup, the limitation of 25 GB can be proven too difficult to deal with and have everything neatly stored for your protection. Among the major advantages of Norton, we find the automatic backups and the use of up to 5 devices. Though file versioning is enabled, these files are only stored for 90 days. 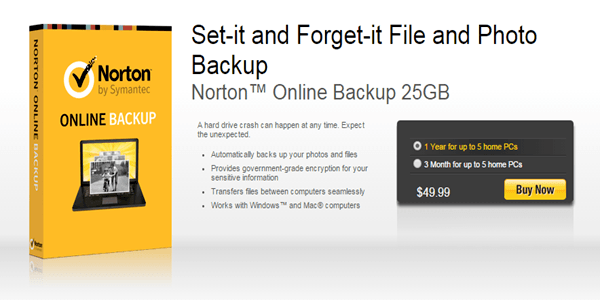 Overall, Norton backup online is a decent solution with restricted data space.